Beginner Taekwondo Classes enrolling in Now! If you want to achieve all your fitness goals, get a great cardio workout and enjoy the added benefit of learning effective self-defence, Taekwondo classes in Smithfield from Brad Hope Family Martial Arts is right for you. Our Taekwondo program is more than just a workout, it’s a program that teaches students to maintain good habits not only in physical activity and martial arts, but life in general. Through Brad Hope’s well structured classes, students of all ages are able to train in a safe and supportive environment enabling them to form friendships that support them on their way to achieving their goals inside and outside of the dojo. Get fit & learn incredible taekwondo skills in smithfield! Taekwondo is a Korean martial art and combat sport as well as the National sport of South Korea. Often translated as “The way of the foot and fit”, Taekwondo is an excellent way to improve your balance, strength, speed, flexibility and stamina. 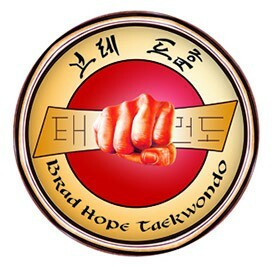 Brad Hope Family Martial Arts’ Taekwondo classes will teach you a wide variety of kicks and punches including reverses, jumping, spinning and sliding, often in combination. Our Taekwondo training includes a system of blocks, punches, and open-handed strikes that are effective for adults and teens no matter their fitness level. Join now & burn calories while learning effective and practical self-defence! Fill out the short form on the side of this page and have all the information you need to get started immediately sent to your inbox. Start your transformation today at Brad Hope’s Family Martial Arts!